Molavi, F., Rezaee Nik, E. (2016). A stochastic model for project selection and scheduling problem. Journal of Industrial Engineering and Management Studies, 3(1), 77-88. F. Molavi; E. Rezaee Nik. "A stochastic model for project selection and scheduling problem". 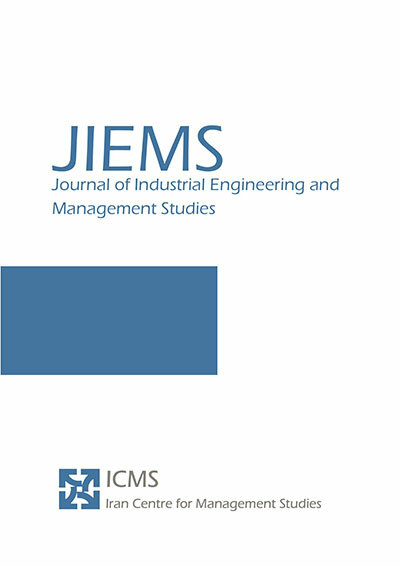 Journal of Industrial Engineering and Management Studies, 3, 1, 2016, 77-88. Molavi, F., Rezaee Nik, E. (2016). 'A stochastic model for project selection and scheduling problem', Journal of Industrial Engineering and Management Studies, 3(1), pp. 77-88. Molavi, F., Rezaee Nik, E. A stochastic model for project selection and scheduling problem. Journal of Industrial Engineering and Management Studies, 2016; 3(1): 77-88. 1Sadjad University of Technology, Mashhad, Iran. Resource limitation in zero time may cause to some profitable projects not to be selected in project selection problem, thus simultaneous project portfolio selection and scheduling problem has received significant attention. In this study, budget, investment costs and earnings are considered to be stochastic. The objectives are maximizing net present values of selected projects and minimizing variance of them. Benefiting an efficient multi-objective approach to satisfy every conflicting objective, an integer non-linear goal programming model is developed. Another contribution of this paper is to consider cost dependency between the projects, in project portfolio selection and scheduling problem. Due to the complexity of this problem, especially in large sizes, imperialist competitive algorithm and genetic algorithm are presented. The effectiveness of the model and proposed algorithms are demonstrated via a case study in a knowledge based company at Ferdowsi University of Mashhad. The result shows high performance of the both proposed algorithms. Atashpaz-Gargari, E. and Lucas, C., 2007. “Imperialist Competitive Algorithm: An Algorithm for Optimization inspired by imperialistic Competition”, IEEE Congress on Evolutionary Computation, 4661–4667. Singapore. Carazo, A. F., Gómez, T., Molina, J., Hernández-Díaz, A. G., & Guerrero, F. M., 2010. “Solving a Comprehensive model for multi-objective project portfolio selection”, Computers & Operations Research, 37(4): 630 – 639. Coffin, M. A., and Talor, B., 1996. “Multiple criteria R&D project selection & scheduling using fuzzy logic”, Computers Operational Research, 23(3): 207-220. Ghorbani, S. and Rabbani, M., 2009. “A new multi-objective algorithm for a project selection problem”, Advances in Engineering Software, 40(1): 9-14. Golmohammadi, A. and Pajoutan, M., 2011. “Meta heuristics for dependent portfolio selection problem considering risk”, Expert Systems with Applications, 38(5): 5642–5649. He, F. and Qu, R., 2014. “A two-stage stochastic mixed-integer program modeling and hybrid solution approach to portfolio selection problems”, Information Sciences, 289: 190-205. Huang, X. and Zhao, T., 2014. “Mean-chance model for portfolio selection based on uncertain measure”, Insurance: Mathematics and Economics, 59: 243-250. Huang, x. andZhao, T., 2014. “Project selection and scheduling with uncertain net incomeand investment cost”, Applied Mathematics and Computation, 247: 61- 71. Koski, J., & Silvennoinen, R., 1987. “Norm methods and practical weighting in multicriterion optimization of structures”, International Journa for numerical methods in Engineering, 24(6): 1101-1121. Lotfi, M. M. and Ghaderi, S.F., 2013. “Sort- term Price- based Unit Commitment of Hydrothermal GenCos: A Pre-emptive Goal programming Approach”, International Journal of Engineering Transactions: Aspects, 26(9): 1017-1030. Naderi, B., 2013. “The Project Portfolio Selection and Scheduling Problem: Mathematical Model and Algorithms”, Journal of Optimization in Industrial Engineering, 6(13): 65-72. Nahvi, H. and Mohagheghian, I., 2011. “A practical Swarm optimization algorithm for mixed variable nonlinear problem”, International Journal of Engineering Transaction A: Basics, 24(1): 65-78. Nikkhahnasab, M. & Najafi, A. A., 2013. “Project Portfolio Selection with the Maximization of Net Present Value”, Journal of Optimization in Industrial Engineering, 6(12): 85-92. Orumie, U. C. and Ebong, D., 2014. “A Glorious Literature on Linear Goal Programming Algorithms”, American Journal of Operations Research, 4(2): 59-71. Rabbani, M., Tavakkoli- Moghaddam, R., Jolai, F. and Ghorbani, H.R., 2006. “A comprehensive model for R&D project portfolio selection with zero-one linear goal Programming”,International Journal of Engineering Transactions a: Basic, 19(1): 55–66. Rao, S.S.; Freiheit, T.I., 1991. “A modified game theory approach to multiobjective optimization”, J. Mechanical Design, 113(3): 286-291. Sefair, J. A. &Medaglia, A. L., 2005. “Towards a model for selection and scheduling of risky projects”, Proceedings of the Systems and Information Engineering Design Symposium, 158 – 164. Virginia, USA. Shahnazari-Shahrezaei, P., Tavakkoli- Moghaddam, R. and Kazemipoor, H., 2011. “Solving a bi-objective manpower scheduling problem considering the utility of objective functions”, International Journal of Engineering Transactions B: Applications, 24(3): 251- 262. Tavana, M., Keramatpour, M., Santos-Arteaga, F. J. and Ghorbaniane, E. In Press, Uncorrected Proof. “A Fuzzy HybridProject Portfolio Selection Method Using Data Envelopment Analysis, TOPSIS and Integer Programming”,Expert Systems with Applications. Available onlinefrom http://www.sciencedirect.com/science/article/pii/S0957417415004595. Tseng, CH. CH. & Liu, B. SH., 2011. “Hybrid Taguchi-genetic Algorithm for Selecting and Scheduling a Balanced Project Portfolio”, Journal of Science and Engineering Technology, 7(1): 11-18. Zhu, H., Wang, Y., Wang, K. and Chen, Y., 2011. “Particle swarm optimization (PSO) for the constrained portfolio optimization problem”, Expert Systems with Applications, 38(8): 10161–10169.